Posting this for a friend who's looking for answers I can't find. He bought a "Trombone" pipe with a silver hallmarked band. The band has EB inside a diamond above the hallmark. 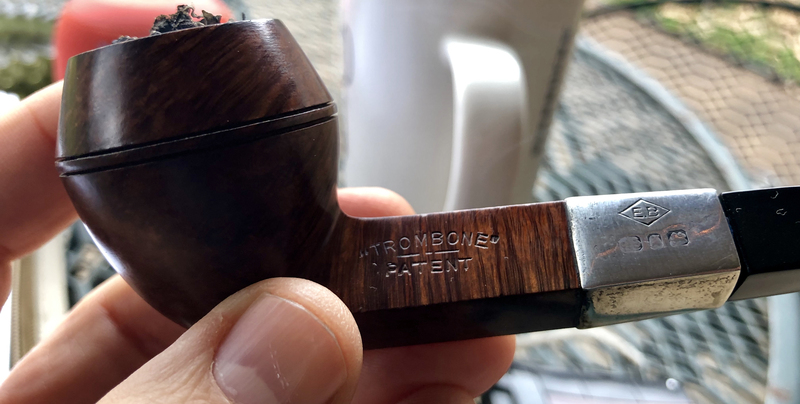 He was told it's a Barling but I've never come across a Barling with that type of logo on the band. Any of you recognize this one? I've looked at pipedia and Phil's but can't find anything. Likes: JustScott, Salcheech and Sentient. I’ll will have to ask him . I talked to my friend. He said his pipe doesn't have the tube and the stem is real loose. It sounds like it doesn't have the original stem on it. I suggested a couple of places he can send it to have a stem made to fit.